Dependency Injection is a very common technique in software engineering whereby an object supplies the dependencies of another object. Means that DI is about passing a dependency object to another a dependent object. Assume we have a client and a service that would be used by the client. We pass the service to the client rather than allowing the client to build it. DI is commonly related to a wide known taxonomy which is Inversion of control aka IoC. But simply, IoC is a more general than the DI. IoC means letting the other code call you rather than insisting od doing the calling. All of this is managed through the Spring Container which requires some sort of configurations that are presented through XML-based configuration or Annotation-based configuration. We will focus on the Annotation-based one in the below subjects. Let's assume we have a requirement for building a notification service that's responsible for sending different notifications through different services like Email or SMS. Hence we will have a NotificationService class that's composed of some other services like EmailService and SMSService. Message.java represents the model for an object that will be passed to whether the constructor or the setter method during the injection. MessageService.java is the interface to unify the contract for two services that will create. It contains only one method signature that will be implemented later. We will create two beans each with unique names emailService and smsService that we will use for injection through the AppConfig class. Now let's talk precisely about the DI in Spring that exists in two major types: Constructor-based and Setter-based. This is achieved by invoking the constructor arguments and passing the relative arguments objects to it which we already call dependencies. Let's see how we achieve so in our example. We create a dependency for the model object Message in the AppConfig.java class configurations and set the values for its properties. We will actually create two dependencies for this dependency model. The class EmailServiceBean.java is the first implementation of the MessageService interface. So it implements the the sendMessage() and prints to the console the values of the Message object. As you can see there are no setter method for the object of Message rather than that we have one a constructor that we will depend on for the constructor injection. On the other hand, Setter-based injection is achieved by calling a setter method in our bean which will be SMSServiceBean that has composition of also the Message model. So the Spring container injects the other reference of the Message dependency with name equals smsMessage that's why we user the @Qualifier annotation above the setMessage method. SMSServiceBean.java is another implementation for the interface MessageService. This one is similar to the EmailServiceBean but it contains a setter method for the Message object. This method is annotated with @Autowired to point out that the Message object will be injected through the Spring container as a setter-based injection. We can also use the JUnit case ApplicationTest.java for initiating the Spring container and testing both services (EmailServiceBean and SMSServiceBean). When to use what?. Actually we can mix using both but Spring encourages using the constructor-based injection for the mandatory dependencies and the setter-based injection in the optional ones.Despite of we can use @Required annotation on the setter method to make the property a mandatory dependency. Also, it's recommended to use the constructor-based to implement application components as immutable objects and to ensure that required dependencies are not null. Eclipse Luna that's shipped with the M2E plugin by default. So no need to install the plugin yourself.WildFlye 8.x. 1- Select from the main menu File->New->Other. 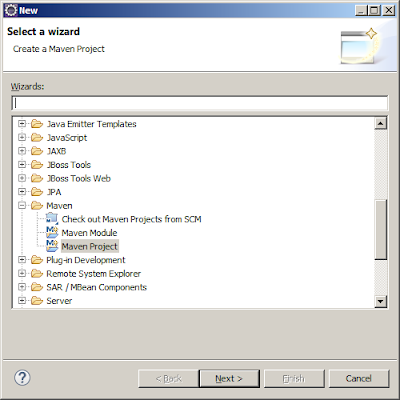 Then select Maven->Maven Project.